Ordaz-Díaz, L. A., Valle-Cervantes, S., Rojas-Contreras, J. A., Rodríguez-Flores, F. J., and Bailón-Salas, A. M. (2016). "Optimization of a microbial formulation acclimated for pilot-scale biodegradation of paper mill effluent," BioRes. 11(1), 1071-1079. A pilot-scale aerated lagoon was used for the aerobic treatment of pulp and paper mill effluent from September 1 to December 1, 2014. 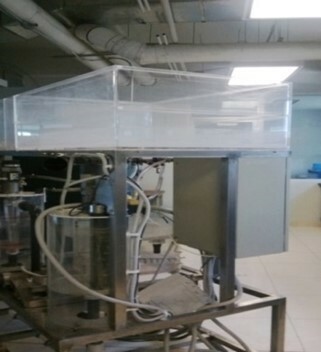 The aerated lagoon was installed at the chemistry laboratory in the Chemical Engineering Department at the Durango Institute of Technology and was fed with real pulp and paper mill effluent. The experimental work was run under various operating conditions. The operating parameters (total and volatile suspended solids (VSS) and dissolved oxygen concentration (DO)) and environmental variables (temperature, pH, COD, and BOD5 of influent water) were monitored daily. In all the experiments conducted, the aerated lagoon generated an effluent of optimal quality complying with the requirements of SEMARNAT (2003) and CONAGUA (2003). A model that explains the behavior of the system under realistic operating conditions was obtained. The model indicated an optimal DO of approximately 4 mg/L for concentrations up to 1000 mg/L, showing variations in concentrations above this value. This data indicate that the flexibility of the bacterial formulation and its ability to adapt to environmental changes play an important role in the stability of an aerated lagoon. Systems for treatment of industrial wastewater must meet two objectives. First, they must meet the increasingly rigid requirements of environmental laws. Second, they must reduce the operating costs and construction required for treatment, as this plays an important role in the economy of the industry. To satisfy these requirements, it is necessary, in addition to effective treatment processes, to have effective control strategies. In the treatment of industrial wastewater containing toxic compounds, few systems operate successfully. The greatest difficulties arise because of the variability of residual water with respect to both its composition and its flow, because such substances (COD, BOD, turbidity, color, chloride, and organochloride compounds) show inhibitory activity. Large aerated lagoons are commonly used in the pulp and paper industry for biological wastewater treatment. Atmospheric oxygen transferred at the water surface is not sufficient for the aerobic bacterial process, so treatment has to be supplemented by mechanical aeration. Mixing is necessary to maintain partial suspension of bacterial solids and to ensure the bacteria has adequate contact with organic pollutants (Pougatch et al. 2007). Aerated lagoons are the main process for treating wastewater from the paper industry. Many of them involve bacterial inoculation with in situ formulations whose effectiveness has not been demonstrated, which can result in low efficiency in treatment and unnecessary investments. Lack of knowledge of bacterial biodiversity in a pond limits the ability to fully exploit its capacity for biodegradation. These plants effectively remove 5-day biochemical oxygen demand (BOD5), total suspended solids (TSS), and total phosphorus. In the literature, the importance of the physicochemical parameters (BOD5, COD, and pH) in the design and analysis of biological treatment systems is overemphasized. However, statistical methods to determine the significance of these parameters is seldom used (Environment Canada 2004). The experiments were designed according to the previous work of Ordaz-Díaz et al. (2014). The experimental prototype (IC14D-ITD) was purchased from DIDACTA Company of Italy; it is displayed in Fig. 1. The main elements of the system were the rectangular tank (1.32 m by 0.97 m, 170 L operating volume). The aeration system supplies oxygen to the biomass for cell metabolism. A compressor was used to pump extra air into the reactor. The aeration system was controlled by opening and closing valves with submersible aerators. However, the aeration system proved in preliminary tests to not provide enough air for adequate aerobic conditions in the experimental prototype. These strategies ensured a concentration of dissolved oxygen in the range of 1.38 to 5.62 mg/L during operation. Control devices were available to monitor the aerated lagoon’s temperature, pH, and concentration of dissolved oxygen. The plant was operated for seven days for each treatment. The system was run with real pulp and paper wastewater, supplied by Bio Pappel S.A.B. de C.V., Durango, Dgo. Mexico, which was used in the innovative formulation LCN (Bacillus licheniformis + Cellulomonas cellasea + Aspergillus niger) to exhibit the best reduction of BOD (Ordaz-Díaz et al. 2014). The pulp and paper effluent present in the aerated lagoon was sterilized to ensure only the added formulation would affect the results, making it possible to evaluate its efficiency. The experimental work in the plant was conducted from September 1, 2014 to December 1, 2014. Analysis was performed on the physical parameters, chemical parameters, and efficiency of the aerated lagoon for the removal of organic matter (BOD5). The concentrations of volatile suspended solids (VSS) and BOD5 of the influent and effluent water were determined according to the Standard Methods for Examination of Water and Wastewater (APHA 2001). The sample data were analyzed using analysis of variance (ANOVA), and the analysis was done with the statistical program “Statistica 7”, version for Windows (Stat Soft, 2003). The coefficient of fit and mean difference tests to detect significant differences between the means of %BOD5 removals. A central composite design response surface was used that consisted of a factorial 22 with four star points compound to study the effects of the concentration of DO used and urea-phosphate ratio (U:P), as well as to optimize the response; this was the BOD5. Ten optimization treatments were studied to explore the possibility of using the model as a predictive tool to evaluate lagoon optimization or treatment upgrade. Model validation tests were performed on the residual, analyzing if they meet the assumptions of normality, homogeneity of variance, and independence. Previous experiments (Ordaz-Díaz et al. 2014), ere the basis for the experimental design shown in Table 1. Data in Table 1 reflecthat the influent water had a high degree of pollution. The pH values were maintained in a similar range under all operation conditions, oscillating between 7 and 7.2. The dissolved oxygen values were mostly maintained at the values that were established for each treatment once the stable conditions were reached. As expected, temperature did not exhibit significant variations. In Table 2, it can be observed that there was a color increase in the effluent resulting from the formation of biomass, compared with the study of Taseli and Gokcay (1999) from Penicillium sp, which was used to remove 50% of color (Duran et al. 1994; Gokcay and Dilek 1994; Sakurai et al. 2001). Saxena and Gupta (1998) showed that P. chrysosporium in combination with P. sanguineus, H. ostreatus, and P. annosum, besides adding a surfactant were able to remove color, COD, and lignin. *Platinum-Cobalt measured for Standard methods (APHA 2001). Table 3 shows a decrease in turbidity. This was comparable to results reported by Rohella et al. (2001) who treated bleaching effluent water from pulp and paper mills by polyelectrolytes, achieving high turbidity removal. Wang and Pan (1999) reported using coagulants, such as polyethylene oxide, to increase turbidity and VSS in papermaking effluents. Chandra and Singh (2012) used a bacterial treatment and managed to remove up to 96.0% Color. It should be noted that there are few reports on the turbidity parameter. *Nephelometric turbidity unit measured for Standard methods (APHA 2001). Table 4 shows that the concentration of VSS remained constant, compared to the work of Thompson et al. (2001). They established sedimentation plants for pulp and paper in the UK, which contributed to the removal of more than 80% of solids suspended on average. Rajvaidya and Markandey (1998) implemented a primary clarifier, which also contributed 70% to 80% removal. Gubelt et al. (2000) reported the removal of 65% to 95% of a VSS system using dissolved air flotation. In Table 5, it is shown that the best results were achieved with experiments IV (91.86%), VIII (93.42%), and X (93.27%). These results can be compared to those of Welander et al. (1997), who reported a removal of 30% to 40% of COD in a full-scale system and 60% to 70% on a pilot plant scale. Achoka (2002) reported 50% removal of the chemical components of an oxidation pond. Schnell et al. (2000) reported the removal of polychlorinated phenols and BOD in an aerated lagoon. Magnus et al. (2000) reported 93% removal of BOD and 65% removal of COD when using a compact biological reactor. Rovel et al. (1994) removed 76% of BOD and 62% of COD using biofilters. Rudolfs and Amberg (1953) showed that with aerobic treatment of white water and paper pulp, removal of 70% to 80% of the BOD can be achieved. Rajeshwari et al. (2000) reported 50% reduction in BOD using a fluidized bed reactor. A combination of coagulation-oxidation can remove 50% of COD (Verenich et al. 2001). A combination of ozone and biofilm reactor removed 80% of COD (Helble et al. 1999). Nakamura et al. (1997) reported the efficiency of lignin degradation by combining ozone and activated sludge processes. Jokela and Keskitalo (1999) reported that the combination of DAF and chemical precipitation system removed 57% of BOD7 and 92% of COD. Lescot and Jappinen (1994) showed that a combination of an aerated lagoon and a secondary effluent clarifier from pulp and paper mills in Finland resulted in the removal of 87% of BOD7, 96% of COD, and 53% color. Rusten et al. (1994) reported the combination of a biofilm reactor followed by an anaerobic reactor and two anaerobic reactors; such a system removed 50% of COD and 80% to 90% of BOD7. Chandra and Singh (2012) used a bacterial treatment and managed to remove up to 91.11% COD and 92.74% BOD. There was significant reduction in color and other physicochemical parameters after bacterial treatment with innovative formulation. Statistical analysis of the results obtained from the prototype BOD5 end IC14D-ITD was performed using a generalized linear model (factorial regression) “Statistica 7”, version for Windows (Stat Soft, 2003); this model shows an adjustment coefficient of 0.72 (Table 6). Figure 2 shows the response surface conditions in which the largest removals are reached. In Fig. 2a, initial BOD image above 600 mg/L suggests that the optimal dose of UF is 1:1. In Fig. 2b, the best removals were achieved with higher doses of DO. Using the validated Fig. 3, the DO values for different optimum ratios were found U:P according BOD5 values in a range of concentrations from 100 to 1400 mg/L. The study and data demonstrated the efficiency of the formulation in the aerated lagoon under all conditions tested, as the quality of the effluent was optimal to fulfill the requirements of SEMARNAT (2003). Using the LCN ( licheniformis + C. cellasea + A. niger) formulation in the IC14D-ITD prototype in real operating conditions, the model that explains the behavior of the system was obtained, showing that the optimal DO is approximately 4 mg/L for concentrations up to 1000 mg/L, showing variations in concentrations above this value. The support of the National Council for Science and Technology (CONACYT), the Direction General de Institutes Tecnológicos, and Bio-PAPPEL SAB CV industry was greatly appreciated during the course of this research. CONAGUA (2013). National Water Commission. Rights Federal Law. Provisions Applicable to National Waters 2013. Collection General Coordination and Inspection.pp.1-99. Environment Canada (2004). “Guideline for the release of ammonia dissolved in water found in wastewater effluents,” Canada Gazette 138(49), 3489-3497. Gokcay, C. F., and Dilek, F. B. (1994). “Treatment of effluents from hemp-based pulp and paper industry (II) biological treatability of pulping effluents,” Water Science and Technology 29(9), 161-163. Gubelt, G., Lumpe, C., and Joore L. (2000). “Towards zero liquid effluents at Niederauer Muhle. The validation of two novel separation technologies,” Paper Technology (UK) 41(8), 41-48. Lescot, J. C., and Jappinen, H. (1994). “Effluent treatment in pulp and paper mills: Present technology and development trends,” Appita Journal 47(4), 330-332. Magnus, E., Hoel, H., and Carlberg, G. E. (2000). “Treatment of an NSSC effluent in a biological high-efficiency compact reactor,” TAPPI Journal 83(1), 149-156. Rajvaidya, N., and Markandey, D. K. (1998). Advances in Environmental Science and Technology: Treatment of Pulp and Paper Industrial Effluent, A. P. H. Publishing, New Delhi, India. Rohella, R. S., Choudhury, S., Manthan, M., and Murthy, J. S. (2001). “Removal of color and turbidity in pulp and paper mill effluents using polyelectrolytes,” Indian Journal of Environment Health 43(4), 159-163. Rovel, J. M., Trudel, J. P., Lavalle, P., and Schroeter, I. (1994). “Paper mill effluent treatment using biofliltration,” Water Science and Technology 29(10-11), 217-222. Rudolfs, W., and Amberg, H. R. (1953). “White water treatment: V. Aeration with nonflocculent growths,” Sewage and Industrial Wastes 25(1), 70-78. Rusten, B., Mattsson, E., Due, B. A., and Westren, T. (1994). “Treatment of pulp and paper industry wastewaters in novel moving bed biofilm reactors,” Water Science and Technology 30(3), 161-171. Saxena, N., and Gupta, R. K. (1998). “Decolourization and delignification of pulp and paper mill effluent by white rot fungi,” Indian Journal of Experimental Biology 36(10), 1049-1051. SEMARNAT (2003). “Establishes the maximum permissible limits of pollutants in wastewaters discharges into national waters,” Official Newspaper of the Federation, Sunset Review April 23, Ministry of Environment and Natural Resources, NOM-001-SEMARNAT-1996. http://biblioteca.semarnat.gob.mx/janium/Documentos/Ciga/agenda/DOFsr/DO2470.pdf. Accessed on May 6, 2014. StatSoft, Inc., 2003. STATISTICA (data analysis software system), Version 7. Verenich, S., Laari, A., and Kallas, J. (2001). “Combination of coagulation and catalytic wet oxidation for the treatment of pulp and paper mill effluents,” Water Science and Technology 44(5), 145-152. Wang, I. C., and Pan, T. T. (1999). “Interference of some papermaking chemical additives in the coagulation of wastewater,” Taiwan Journal of Forest Science 14(4), 367-384. Article submitted: September 9, 2015; Peer review completed: November 16, 2015; Revised version received and accepted: December 3, 2015; Published: December 8, 2015.